The introduction of European firearms has led to fierce wars between the Maori tribes. 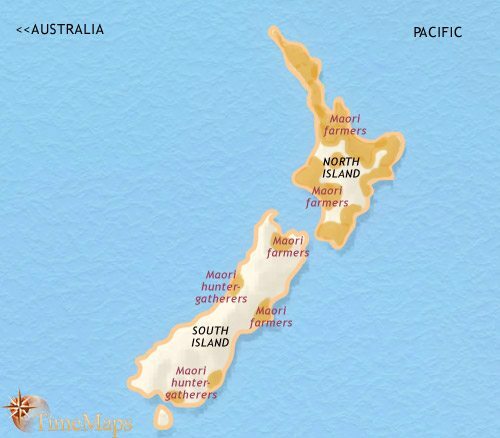 New Zealand is inhabited by a people of Polynesian descent, the Maoris. 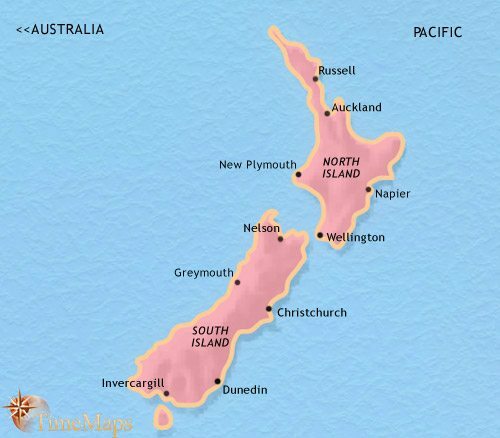 New Zealand is now a part of the British empire. Refrigerated cargo ships have greatly expanded New Zealand's economy. 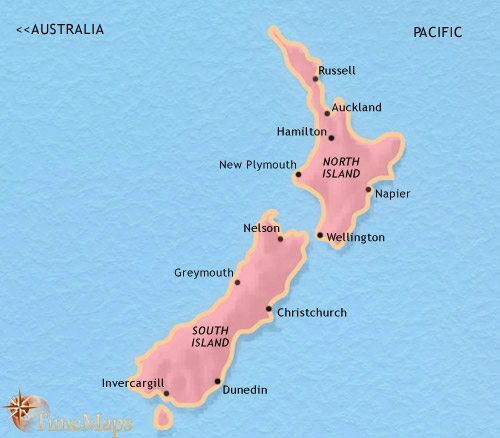 New Zealand is a fully independent country within the British Commonwealth. New Zealand has successfully re-orientated its economy away from reliance on Britain. 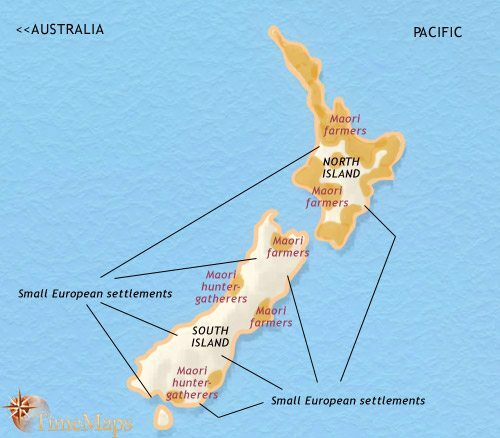 A few small European settlements have been established on the coast of New Zealand from the 1790’s onwards, limited to whaling bases and Christian missions. Their impact on the Maori population has been huge, however, as traders have brought muskets with them, swapping them for food and other items. These firearms have destabilized the balance of forces within Maori society and led to a bloody period of inter-tribal warfare known as the Musket Wars. In these, some Maori tribes have been driven from their ancestral lands, whilst others have been eliminated completely. Furthermore, European diseases kill thousands of Maoris, by some estimates as many as half. The Maoris of New Zealand are descended from Polynesians who arrived in the North Island sometime around the 13th century. They quickly spread throughout both islands. The tropical crops they brought with them were unsuited to the temperate climate of most of the country, and the settlers were forced to adopt a largely hunter-gatherer lifestyle. The abundant wildlife, including the huge, flightless bird called the Moa, offered plentiful food. However, this was soon depleted, and the Maoris were forced to focus on growing only those domesticated plant able to survive winter frosts, the sweet potato. This was supplemented by native ferns. Even this was only possible in the warmer North Island and the northern tip of South Island. Throughout the rest of South Island, a thinly-scattered population continued to live a hunter-gatherer way of life. In the North Island, warlike chiefdoms, centred on numerous fortified earthworks called “Pas”, have developed. More than 5000 Pas have been traced, a graphic reflection of the violent competition for good land. The modern history of New Zealand began with the Treaty of Waitangi in 1840, which established New Zealand as a British colony. By the terms of this treaty, between the British government and the Maori chiefs, the Maoris have ceded sovereignty to Britain in return for protection of their land rights and the right to manage their own affairs. The first organized British settlement was established the same year. With dreary inevitably, there occured clashes over land between settlers and Maori, and warfare has continued throughout the 1860’s and into the early 70’s. At times, almost the whole of North Island has been engulfed in conflict. More positively, these years have seen the opening up of the (largely uninhabited) South Island, especially to sheep and wheat farmers. For a time, the South Island town of Dunedin is the largest settlement in New Zealand. Refrigerated cargo ships have greatly expanded New Zealand’s economy, opening up the European market to New Zealand meat and dairy produce. A long-lasting, Liberal government puts in place the foundations for one of the most advanced welfare states in the world, between 1891 and 1912. 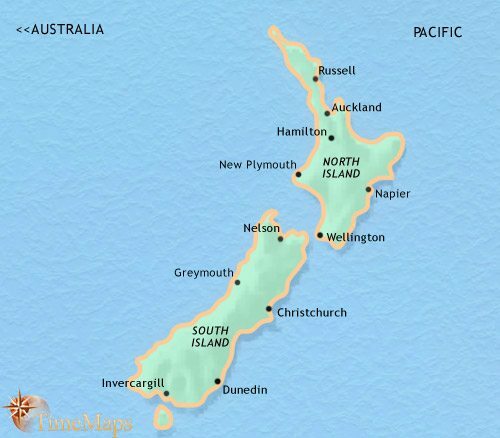 In 1907, New Zealand is made a Dominion within the British Empire. This gives it effective independence. New Zealand armed forces played an important part in the World War 1, most famously in the ANZAC formation, which bore the brunt of the fearful fighting at Gallipoli. Between the wars, the Great Depression of the 1930’s led to further social legislation. In World War 2, New Zealanders fought in many theatres, at sea, on land and in the air. In 1947 the terms of the Statute of Westminster came into force for New Zealand. This statute had originally been passed by the British parliament in 1931, and had affected Canada and Australia at that time. It was only now made applicable to New Zealand, however. By its terms, New Zealand became a sovereign state within the British Commonwealth of Nations, with equal status with Britain. The countries continued to share the British monarch as the head of state. The later Twentieth century has seen New Zealand asserting itself by such acts as banning all nuclear warships from its ports, in 1985. This cooled its relations with the USA for a time. The 1970’s and 80’s were difficult years for New Zealand. One factor was the loss of special trading status with Britain, as the latter orientated itself economically away from the Commonwealth and towards Europe. The New Zealand government responded by sweeping reforms of the economy, making it more business-friendly and encouraging an entrepreneurial culture. Maori culture has experienced a revival in the later Twentieth Century and, as a group, their social and economic position has benefited from their pressing for compensation for the injustices of the colonial era.